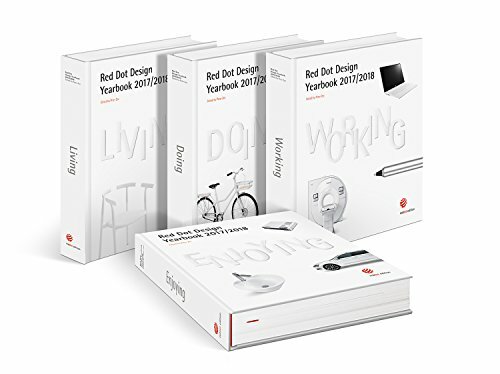 Red Dot Design Yearbook 2017/2018 set (Living + Doing + Working + Enjoying) marries the areas of life and living, activity and lifestyle, and work and technology, as well as leisure and relaxation. Anyone with an interest in design will want to invest. Year after year, Red Dot provides a vibrant picture of the design industry and its current developments, broken down into different thematic categories. The winning products showcase model developments, potentials, and trends in current product design that will whisk you away into a fascinating world full of beauty and functionality. Professor Dr. Peter Zec, born 1956, is an international well-known design expert. He is the founder and CEO of Red Dot. He has been active for over 20 years as a communications and design consultant for numerous companies and lectures throughout the world in design-relevant topics. As an expert on the international design scene he is the publisher of the Red Dot Design Yearbook and the International Yearbook Communication Design. He has published the following books among others: Informationsdesign (1988), Design goes virtual! (1996), German Design Standards (1997; 2005), Designing Success (1999), Good Design (2000), Orientierung im Raum (2002), Hall of Fame. Companies Searching for Excellence in Design (2003; 2007), Return on Ideas - Better by Design (2006), Who's Who in Design (2003; 2007), The Design Value - a Strategy for Business Success (2010).